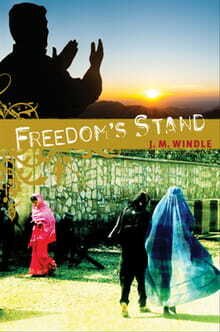 EDITOR’S NOTE: The following is an excerpt from Freedom’s Stand by Jeanette Windle (Tyndale). “Why did you permit him to walk out alive?” Fury vibrated the cell phone’s speaker unit. The same image filled both speakers’ cell phone screens. “Who could have known it was under our noses all this time?” Ismail said. The photo was not one a decent woman would exhibit outside her own family. But even in Afghanistan, mug shots required that more than a burqa be visible. Escaping, brown curls under a headscarf framed pale, oval features, an expression of combined despair and defiance incongruous in so youthful a face. But it was the eyes glaring at an unseen camera through a fringe of long and curling lashes that drew a murmur of satisfaction from both speakers. Scornful, a sheen of tears discernible even in JPEG, they glimmered the deep lapis lazuli of a Band-e Amir mountain lake. When Jamil had saved that burned child’s life, he hadn’t expected to find himself running for his own. Jamil glanced back over his shoulder. He was pulling away from the mob. No, the mob had chosen to drop back. Though another hail of rocks hissed through the air, the throwing was halfhearted. But then the men weren’t trying to kill him. Only to drive Jamil—and his words—from their village. All had b egun so well too. The village was like any other in southern Afghanistan, dirt cubes behind dirt walls on aparched plain. A riverbed that ran full during wet season was now only dry boulders, but a communal well permitted survival year-round. Jamil had been refilling his water bottle when a villager invited him to share the evening meal. The hospitality of the Pashtun tribes was as legendary as their ferocity. And their poverty. Mud walls of his host’s reception chamber bore no whitewash. Threadbare carpet and tushaks covered a dirt floor. A platter set before Jamil and male household members held only rice with a scant topping of lentils. Thin faces and eager eyes of children peeking around a doorway to watch the men eat restrained Jamil’s own hunger. An injustice, Ameera would protest. A reminder that Ameera was gone now from Jamil’s world. The woman who’d first introduced him to Isa. He’d heard her voice only once since being expelled from Kabul. When he again reached a place where his cell phone functioned, her own phone was out of service. He’d called Rasheed instead, only to be told that Ameera had returned to her own country and he was never to call again. A burqa was pouring tea when Jamil heard the scream. Its anguished pain was too great to consider propriety. His host’s own distress was such he hadn’t objected to Jamil following into the family quarters. The screams came from a boy no more than two years old. Water boiling for tea had been removed from a cookfire onto a nearby stone block. The toddler had pulled the entire pot over himself. Panicked women were yanking off wet clothing, blistered skin sloughing away with it. Jamil reacted with pausing for thought. Grabbing a pottery jar of water, he elbowed through the shrieking circle to pour its contents over the child. A chill winter breeze made the wetting as effective as an ice pack. The boy was moved to a tushak in the reception chamber, and Jamil urged to stay on as guest. Jamil showed the family how to rinse burns with mildly salted water against infection, how to spread petroleum jelly so healing fingers and joints didn’t become fused together. In return, his grateful host not only allowed Jamil to read Isa’s words, but summoned the rest of the village to his compound. As news spread of the visiting healer, they arrived with their own aches and pains. An abscessed boil. A poorly set broken arm. An infant with diarrhea. An infected eye. Nothing Jamil couldn’t handle. One advantage of these people’s harsh lives was that if they survived to adulthood, they were as tough and enduring as cured goat skin. And they stayed to listen when Jamil spread his patu to read from his Pashto New Testament. After all, did not everyone know that Islam’s most prominent prophet beyond Muhammad himself had been a great healer? If not usual, there could be no harm in hearing words purported to come from Isa Masih. Especially when spoken by one gifted with healing hands. Yes, whether or not Jamil had actually saved the boy’s life, he’d certainly saved him from serious infection and scarring. Though not from pain. Which was why Jamil now fled for his own life into the darkening twilight. By the time Jamil had settled his primary patient that first evening, his host had ended the toddler’s moans with a pinch of opium paste. Jamil hadn’t been happy, but his own supply of painkillers was long gone. Opium was the only medicine available to poorer Afghans. So Jamil held his peace and kept a sharp eye on his young patient. Though useful, opium paste was harder to regulate than its processed cousin, morphine. An overdose slowed breathing. Every winter across Afghanistan, hundreds died of respiratory failure after taking opium to calm flu or pneumonia symptoms. Within days, Jamil had coaxed his host into curtailing the opium to a single nightly dose. By now he was no longer a stranger, but favored community member. So much so that his host had invited Jamil to tour the commercial venture that fed the village during harsh winters. The carpet-weaving workshop was a dark, dank place, its air thick with dust and the acridity of fresh dye so that Jamil had to smother a cough as he followed his host among the looms. Once created by Afghan peasant women to adorn their own homes, the beautiful patterns were now far too valuable to be wasted on the poorest caste who toiled over them. As long as light slanted through the small windows, these weavers would not stir from their crouched positions. But neither women nor children working as steadily as the adults displayed any objection to the tiresome squatting and repeated motion. Then Jamil took in pinpoint pupils. Quickly, he searched faces around him. Yes, that slow, easy breathing. The slumped relaxation even while fingers never stopped knotting those endless threads. All these workers were under influence of opium, even the children. Along the walls lay babies wrapped in patus. Not just small ones, but well up into walking age. Every one so limply asleep, Jamil had to lean close to assure himself they breathed. Here was a face of Afghanistan Jamil had never known in his own earlier, privileged life. Now in each dreaming, vacant face, Jamil saw his own mother and sister. If they still lived, could it be they might find themselves in just such horrific circumstances? And that was that. There’d been a hasty conference of village leaders. His host had at least sent for Jamil’s pack while the men gathered around the well with stones in hand. Now, as the mob headed back to the village, Jamil slackened his steps further. He hadn’t felt so disheartened since beginning his new quest. Arriving at this village, finding welcome at the well, these past days of healing and reading, Jamil had felt he was truly following Isa Masih’s footsteps. Now here too it seemed Jamil’s path emulated the prophet. Hadn’t Isa’s own neighbors driven him out of town? Hadn’t he instructed his own disciples about those who rejected his words? They were not to resist or plead, but to shake the dust from their feet as witness against that town’s unbelief. But Jamil did not want to shake this village’s dust from his feet. Despite those hurled stones, he couldn’t forget their earlier kindliness and hospitality. If they could only come to see Isa Masih as Jamil had. To understand how following his ways could transform their lives and community. Jamil found himself wanting this as fervently as he’d once wanted revenge and retribution. Had Isa’s heart wept over those who’d refused him as Jamil’s heart wept now? His new acquaintance seemed to take for granted Jamil would follow as he headed back to the motorcycle. Gingerly, Jamil squeezed on behind Omed. Twilight had now faded to full night, and the motorcycle had no headlight. But Omed gunned the engine unhesitatingly up ridges and down into ravines until Jamil could not have turned back had he wished, because he’d never have found his way. Then their zigzag trail dropped onto the smoothness of a road, and Jamil spotted a twinkle of lights ahead. As the motorcycle sped between cubic shapes, Jamil could see this town was much larger than the village where he’d last lodged. Shopfronts and the minaret of a small mosque fringed a dirt commons along with the town chaikhana, a combination tea shop and inn for passing travelers. Lighting came from kerosene lanterns, not electricity. Omed was speaking now over his shoulder, but Jamil could make out only an occasional word above the engine. The motorcycle pulled up in front of a long, single-storied concrete building. “If you will wait here, I will return immediately.” As Omed strode toward the chaikhana next door, Jamil walked along the length of the concrete building. A red crescent above one door, the Muslim adaptation of a Red Cross symbol, identified a health clinic. So the town had its own healer. Then why was Jamil here? Another symbol marked a schoolroom. But Jamil’s attention was drawn immediately through a door that stood open. Inside was a familiar village scene. A carpet-weaving cooperative such as Jamil had encountered in the last village. But here a single large room was airy and dry. Kerosene lamps reflected brightly from concrete walls painted a cheerful sunshine yellow. Windows paneled with translucent plastic would provide ample light during day hours. More strikingly, the looms were not backbreaking floor models, but vertical wall units, adjustable so that the section being woven was within easy reach of weavers. Benches permitted sitting instead of crouching on the floor. Just inside the door was a stall where shoppers sorted through finished rugs. The nearest was not a local Pashtun with his light brown hair and round, sunburned features. Rather than shalwar kameez, the tunic and pantaloons of local dress, he wore jeans and a T-shirt, an olive green Army parka instead of a patu. He was also bareheaded and clean-shaven, a fashion becoming popular among Afghanistan’s younger urban residents. In this rural community, he stood out like a jungle parrot among Kabuli homing pigeons. “Jamil, forgive me for tarrying so long.” Omed had returned. “Foreign soldiers built the community center. And an aid organization supplies such looms. I—knew some of their people.” There was hesitation in Omed’s answer. “It was I who convinced the elders to make this change. Though the looms cost the village nothing, they did not at first wish to agree because there are conditions. The women do not weave on Fridays. No opium is permitted. Children may work if their families need them, but only after they attend classes, both boys and girls. Women with small children do not work unless there is someone to watch their child. Accident? Just how much had Jamil missed earlier? But the jerk of Omed’s head indicated a group of men wandering leisurely over from the chaikhana. If Jamil was straining to fill in gaps, the gist became clear as the approaching men swirled around him. A man in lab coat over shalwar kameez pushed open the door under the red crescent. The health clinic was a single room lit by a kerosene lantern hanging from a ceiling hook. Metal shelving and a glass-fronted cabinet held few supplies. On a wooden table a burqa and blanket draped a female shape curled up in fetal position. The woman looked curiously deformed, her shoulder thrusting oddly under the burqa as though a hunchback. Jamil had now caught enough babbled conversation to piece together what had happened. The accident to which Omed had referred was the collapse of a new vertical loom early that morning, wrenching this woman’s shoulder from its socket. At question was whether the shoulder was simply dislocated or more seriously broken. For that Jamil would need to examine the injury. “A dislocation this bad will not restore itself.” No wonder Omed had been so frantic for Jamil to come. If Jamil was no true doctor either, he wasn’t just a villager who’d taken a few first aid courses in order to man the local medical outpost. Jamil didn’t answer immediately. He knew the mechanics of fixing a dislocated shoulder, not only from those long-ago studies, but because he’d helped the American medic tend just such an injury after the New Hope bombing in Kabul. But that patient had been a child, the injury fresh. After a full day, this woman’s torn ligaments and tendons would be hardened into place, the dislocated shoulder well-set into its new position. The man speaking was not the oldest here, his full, long beard still untarnished black. But he carried himself with authority, and he wore the black turban that the Taliban had made infamous as a sign of Islamic piety. Fury swept Jamil. Would the mullah speak out so against interference if one of these men suffered a dislocated shoulder? Were mullah, health worker, even husband really so willing to condemn a woman to a lifetime deformed and crippled rather than reach for a remedy so easily at hand? Lowering his bundle onto the table, Jamil undid its knots. There’d been nothing he could do for those women and children working in drugged stupor so their male family members could squeeze out a few more weavings. Here was not the case. Jamil didn’t look at Omed as he drew out his Pashto New Testament. If he was about to offend the man who’d brought him here, he’d make his apologies later. “Does not Allah also send healers to the children of men? And was not Isa Masih the greatest healer of all? Muhammad himself taught that Isa’s words and actions are to be commended and imitated.” Jamil flipped through the holy book. “I have here the very words of Isa Masih. He was teaching on the holy day when a woman crippled for eighteen years came before him. Having compassion, Isa placed his own hands on the woman, and she was healed. But the mullahs of that village grew angry and demanded to know why he had healed a woman and on a holy day above all. The mullah had crowded close to scrutinize the graceful loops and swirls of Pashto script, his black beard quivering with fury. But among other listeners, Jamil’s reading drew a murmur of surprise and agreement. Raising his eyes from the page, Jamil saw that his audience had grown, villagers squeezing into the clinic to watch, those who couldn’t jostling each other in the doorway. An olive green arm raised above the sea of heads caught Jamil’s eye. It belonged to the outsider from the carpet stall, and Jamil could see in that upraised hand a camera or cell phone angling toward the table. Omed had said Jamil was an answer to his prayers. If so, then Jamil had not been brought here to fail. His fingertips probed through the burqa’s polyester material. Husband and healer were right. The shoulder was not broken, just badly twisted out of location. But the next procedure would still be painful, and Jamil could be thankful the woman had been dosed with enough opium to render her unconscious. The woman’s husband helped without protest. It seemed Haroon had no objection to getting a whole wife back so long as he didn’t have to pay for it! Wrapping his hand in toweling, Jamil thrust it through the burqa material into the woman’s armpit. Then he gripped the affected arm by the wrist, pulling hard even as he pushed against the armpit. The pale blue polyester was slippery, making it difficult to maintain a steady grasp. Sweat had broken out on Jamil’s forehead when a moan signaled returning consciousness. I cannot fail! I must not fail! Show over, Jamil’s audience had drifted away by the time he’d rummaged up a sling among the clinic supplies. Only the health worker Naveed and the black-turbaned mullah remained as Haroon and Omed helped the patient down from the table. Omed’s wife followed them out the door. Jamil was tying up his own bundle when he heard the motorcycle start. Naveed and the mullah stepped forward the moment they were alone with Jamil, fury they’d masked from the approving crowd darkening both faces. Jamil made no attempt to argue. His pack shouldered, he exited the clinic into the night. Where to go now? He’d expected at least a night’s lodging from the patient’s grateful family. He’d no money for the chaikhana, and though he might in other circumstances have negotiated food and lodging in return for treating inevitable injuries and ailments, the mullah’s threat discouraged that option. Well, it would not be his first night sleeping in the open with an empty belly. Copyright © 2011 by Jeanette Windle. All rights reserved. Scripture taken from the Holy Bible, New International Version,® NIV.® Copyright © 1973, 1978, 1984 by Biblica, Inc.™ Used by permission of Zondervan. All rights reserved worldwide. www.zondervan.com. Visit Jeanette Windle’s Web site at www.jeanettewindle.com.